I'm in my office at work, pointing at some Lego next to my computer, and talking to a student who's having trouble writing. I'm explaining to her that I put the Lego there to remind me that every piece of work is done one block at a time, and that if what I'm working on isn't going well one day, I can pull it apart and try rebuilding it the next. "But that's a personal metaphor that means a lot to me," I say. "It's symbolic of how I navigate doing my own work and what I enjoy about being creative, which also has positive associations from when I was a kid. Yours might be different." She sits there quietly, thinking. "What's the first thing that pops into your head?" I ask. We talk for awhile about Post-it notes and how much she likes buying stationery. (Who doesn't!) Eventually we hit upon the idea that the real problem for her is not coming up with ideas, but organising them. "Perfect," I say. "Maybe Post-it notes could be the answer." I think about it some more and ask, "Is it that you have too many ideas?" She nods. "Yeah, and I read too much, and one thing leads to another, and something else, and then something more, and something else again, and I end up with pages of notes and nowhere to start. It all gets jumbled up." I know what she means. I tie myself in knots like that too. We agree that this week she's going to experiment using Post-it notes to structure her writing. We decide that it would be interesting to see what happens if she was only allowed a few keywords or bullet points for each note as a way to contain her ideas and thinking; to confine her writing to one idea at a time; to stop her research and writing spiraling off into endless variations, permutations and elaborations. "Then you could lay all the Post-its out in front of you," I say, "and try telling the story of what you're writing in different combinations until you're happy with it." In 1968 a chemist at 3M, Spencer Silver, was trying to make a super-strong adhesive for aeroplane construction. Instead, his work yielded a weak glue that wouldn't stick to anything. Despite failing to do what he set out to do, Silver thought there was potential in his 'low tac' formula, and for several years tried to drum up interest in it. He spruiked his discovery at numerous seminars but gained little interest. Many years later another 3M employee, Art Fry, was in church. He was getting annoyed that every time he stood up to sing the bookmark in his hymn book kept falling out. He suddenly remembered attending one of Silver's presentations and how Silver's formula for inherently tacky, elastomeric copolymer microspheres could be the perfect solution to his problem. If his bookmark was partly coated with Silver's adhesive, it would keep its place, be re-useable, and leave no residue. Shortly after, he applied for a grant to further develop Silver's work and out of that research came up with the Post-it note. I like this story. It's a little guy triumphs after failure story (even though it's two guys working in a very large multinational company). I guess if Post-it notes have taught me anything it's that finding the solution to a problem might yield the answer to another problem not yet considered. As they say: there are no mistakes, just missed opportunities. In Silver and Fry's case, the search for a super-strong adhesive to keep planes from falling apart led to extremely weak adhesive that was just as useful. I used to work at a different university than the one where I work now. While I was there I made a special point of knowing every department secretary from every section and floor of our building because (1) they where the hardest working people who knew how to negotiate the uni's many complex rules and procedures, and (2) they were the guardians of the precious—the stationery cupboards. When I finished working there, for my going away party, all the department secretaries brought me padded envelopes stuffed with pads, pens, pencils, and Post-it notes. Oh, it was so awesome, and touching! That was ages ago and I'm still using that stuff they gave me. I don't wonder; I know it. I'm crazy about stationery—as tools, as raw material, as vehicles of promise. "Pens are friends" after all. Stationery is analogue. The more I work on Rabbit Hole, the more I realise working solely digitally is not enough for me. There has to be a tactile and visual element to my work for me to be productive. Simulated black words on a simulated white page are not enough. I need the smell of an Artline, the scratchy sound of pencil on paper, a real page to angrily scrunch up and throw into a real wastepaper bin already overflowing with false starts. I need real-world objects and sensations to stimulate, organise and process my ideas. 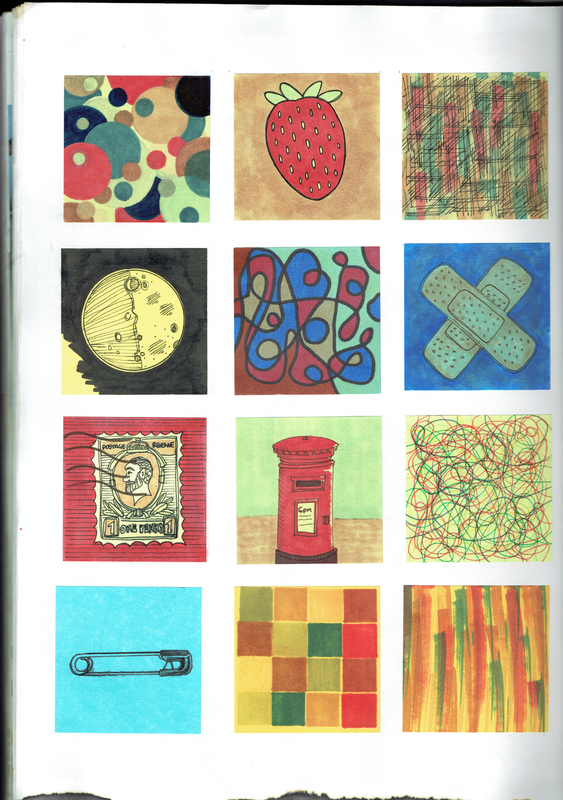 A few years back I bought this book, Drawing From Life: The Journal as Art. Each chapter features a journal from a different artist, and one of those artists is Idelle Weber. Weber was going through a particularly rough few years where she became sick from the chemicals she used in her printmaking, and when she recovered her husband got ill. Not really liking her palm-pilot to organise her calendar (this is a few years back), she would print out a monthly planner, and on top of each day she'd draw a little portrait on a Post-it note. "My belief is that it's better to work than not work" Weber says, and her studio, the book explains, is decorated with hundred and hundreds of little Post-it note portraits on top of calendar pages, some drawn in pen and ink, others in pencil or charcoal; some drawn while killing time riding the subway or spending endless hours waiting in hospital. "Whether it's a release or a feeling of days passing," Weber explains, "I can look back at them and remember what I'm doing." The slightly compulsive part of me loves the idea of this. Of having this store of memory that isn't Facebook or Instragram (even though Facebook or Instragram 'posts' resemble a constant stream of Post-its). I like the idea of having something more immediate, more personal—an analogue trace of the passing days. I mean, when Skynet comes online and the machines start to systematically hunt us down, what will be left of our lives that is not immediately eradicated from CyberInstaTwitterdyne's massive megaservers? In contrast, I like Weber's simple, humble, un-hackable archive—that trace of ephemera that is the byproduct producing work and, well, simply living an cybernetically unaltered life. I feel like this trace is deserving of a new word. Maybe 'craftifact,' blending 'craft' and 'artifact,' spelt with a 'k' to make it sound more Euro-chic. A few years back, I liked Weber's idea so much I tried to copy it, using Post-its as little 3x3 inch canvases every day for a few weeks. And so, for me, Post-its can be used to limit thinking, just as much as they can be used to expand it. To that end they're great for defining discrete parts which then can be considered, rearranged and decided upon—all the while leaving a trail of 'kraftifacts,' which help me track the organic growth of my ideas. And after that, whatever doesn't fit has to be jettisoned. I mean, I didn't get to tell you all of that other crap I had left-over, and that's for the best. This week's Rabbit Hole is a double issue! Check out this week's first guest post, "Covers 3: Superb Assassins", or a related issue Rabbit Hole #10 — “If Lego has taught me anything”.